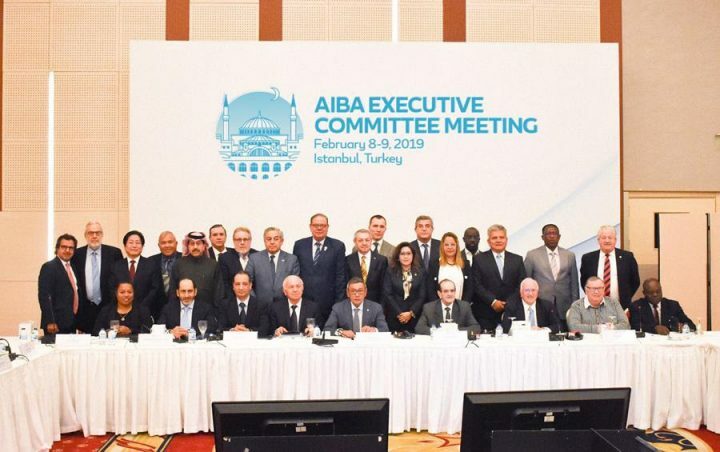 The AIBA Executive Committee convened for a two-days meeting to discuss the current state of affairs and the continued progress towards its new reforms in the Turkish city of Istanbul on February 8 and 9. Among the various topics discussed were the relations with the IOC, appointments of commission chairs, the review and approval of Technical and Competition rule amendments and new business opportunities. The first day of the AIBA Executive Committee meeting clearly highlighted the unity between all members, as each expressed their unwavering support for the new President and the Executive Director in their efforts to move the organisation forward. “On behalf of the Executive Committee, I want to personally thank the President, Executive Director and the AIBA staff – what a difference they have made. I believe, as all the members here do, our top priority is to take care of our National Federations because without each other there is no us, there is no AIBA. […] I can say that I am happy to be a part of this new organisation and to my EC colleagues, if we work as a team, I think we can be very successful”, said Giorgio Brugnoli, Executive Committee member from England. In discussions regarding the relations between AIBA and the IOC, including the update provided by AIBA Executive Director Tom Virgets, points were highlighted regarding the significant progress already implemented to date as well as the importance of working collectively and speaking as one voice in order to defend the interests of the athletes, the national federations and the sport of boxing as a whole. AIBA Vice-President, Franco Falcinelli, commented “I would like to congratulate President Rahimov and Mr. Virgets on all the great work being implemented at AIBA. We are making good progress and together we are moving in the right direction”. He further commented making a point to raise his concern regarding the IOC’s decision to freeze the process of the qualifications for Tokyo 2020 Olympic Games stating, “Is it really in the best interest of our athletes or the so-called protection for our boxers and our sport to wait until the end of June for them to know their participation to the Olympic Games? […] why put boxing’s presence in the Olympic Games in strong doubts for so long?” Heeding these concerns, and with the interest of the athletes in mind, the Executive Committee has decided to take steps forward in planning the placement of the Olympic Qualifications. This process will be conditional on the progress being made with the IOC, but will be able to give a pathway forward for athletes in their plans towards the 2020 Olympic Games. A full update and report from each of AIBA’s confederations were provided to the Executive Committee by the respective Confederation Presidents. Each gave insights into the strong developments being made in each region as well as the progress towards the qualifications for this year’s Men’s and Women’s World Championships being held in Yekaterinburg and Ulan-Ude, Russia. An update on the elections and on governance were also presented to the members, as well as the major challenges faced, ensuring transparency and clarity to all Executive Committee members. A final point on transparency was flagged when the new Asian Boxing Confederation (ASBC) leadership presented their update report and identified a major knowledge transfer issue. The former ASBC leadership, led at the time by Mr. Serik Konakbayev, have set out to destroy the financial data, emails and technical sporting information of the confederation claiming “data protection laws of Kazakhstan” prohibit the transfer of this information. As such a taskforce is being formed to investigate the situation and provide recommendations for disciplinary actions. Furthermore, a presentation from the President of the Russian Boxing Federation regarding international Boxing Day (which was first held in July 22, 2017 on Moscow’s historical Red Square) was made. It was further approved that this day in July will be a universal International Boxing day used to celebrate boxing all around the world. In an effort to include the voice of boxers from around the world, AIBA’s Executive Board passed initiatives for the election of its new Athlete’s Commission. As such, elections will take place at the Men’s and Women’s World Championships later this year, whereby five men and five women will be elected to the commission. National Federations will have the opportunity to nominate athletes for these positions and athletes themselves will vote for their representatives at their respective events. More information regarding the process will be provided to National Federations in the coming weeks. In the meantime, two athletes (one male and one female) have been appointed as interim representatives on the commission. AIBA would like to welcome Mrs. Annemarie Stark (GER) and Mr. Cesar la Cruz. Mrs. Stark herself is a boxer from Germany with four national championship titles to her name and Mr. Cruz is a four-time World Champion and Olympic gold medalist from Cuba. Furthermore, in order to build on the New Foundation Plan and also to ensure that the voices of boxers are heard, AIBA’s President is commissioning the “Fit for Future” initiative which will be the roadmap for the future strategy of the organization. AIBA President Gafur Rahimov said “the purpose of the Fit for Future initiative aims to give a voice to boxers around the world. Young people are the future of our sport, they are creative, they are resourceful and they deserve to be heard. I am calling on the boxers of the world to come together. Your contribution will set the future strategy of AIBA – prepared by boxers for boxers!”. And this new initiative will be headed by the two interim representatives together with working groups of athletes from around the world. More information on this process will be provided to National Federations and athletes in the coming weeks. The appointments of AIBA’s Commission Chairs were also included in the agenda, the full appointments can be found here. Additionally, a training by Executive Director Tom Virgets was made to the Executive Committee which highlighted the important duties and responsibilities of an Executive Committee Board and best practices which each member should keep in mind during their tenure. In a presentation made by AIBA Technical & Rules commission chair, Mr. Pat Fiacco, the review and approval of various Technical and Competition rules were included. In particular, the new protest bout rule was passed with unanimous support, this new rule featuring a video review scheme will introduce the right of a national federation to make a protest onsite at the competition should they believe that a judging decision was made incorrectly. Similar rules have been adapted by other sport organisations, such as the International Tennis Federation. “[The new protest bout rule] is one of the most brilliant rules, by introducing this amendment we are ensuring fair-play and growing the trust from the boxers and expanding our fan’s experiences”, said Executive Committee Member Suleyman Mikayilov of Azerbaijan. Additionally, a positive update has been made to the uniforms, which now allows for sport hijab’s to be used by female boxers should they want due to religious reasons and for uniforms to include colors of countries. Lastly, a number of bylaws were also updated and approved. All updates and approvals are in line with AIBA’s commitment to ensure equality and fair-play within the sport of boxing – the full list of updates will be provided to all National Federations in the coming weeks. In line with the many activities happening at AIBA, AIBA President Gafur Rahimov and Russian Boxing Federation General Secretary Umar Kremlev started day two of the Executive Committee meeting by signing the official host city agreement for the 2019 Women’s World Championships. In addition to city and regional partners, AIBA has also been approached by new sponsors keen to invest in the organisation and the sport. With presentations made by a number of new potential sponsors, the AIBA Executive Board is now reflecting on how these potential partnerships can be integrated into a sustainable effort which will benefit national federations in years to come.